I rarely make puff pastry as it’s so much easier to buy a good all-butter puff ready-made, but making shortcrust is quick and easy, especially if you have a food processor. And it tastes so much better than shop-bought. The types of flour and fat you use will make a big difference to the finished product. Plain flour is usually best for shortcrust but I follow Katie Stewart’s advice when I’m making quiche and use self-raising flour as the raising agents give it a lighter crust. 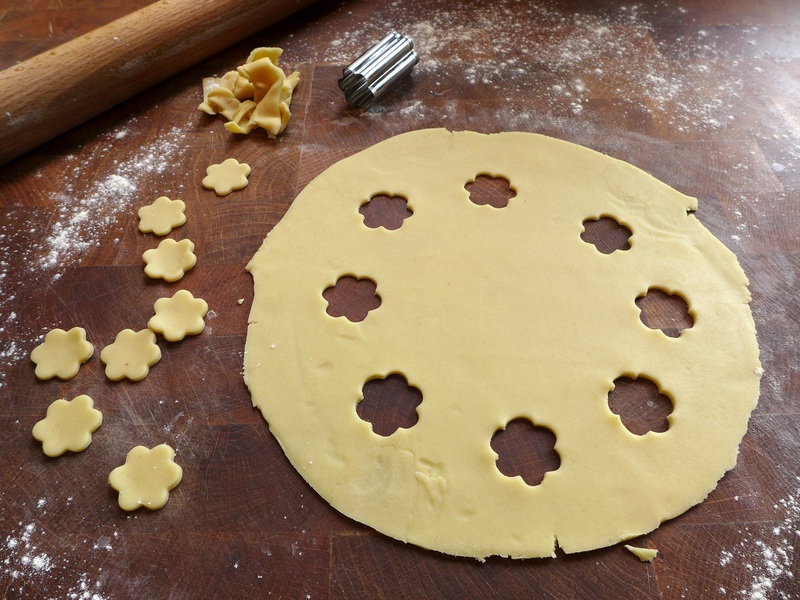 This is a handy tip too for anyone who’s a bit heavy-handed when it comes to making pastry (that’d be me). I use butter and white cooking fat or lard in equal measures for a basic shortcrust. The butter gives it flavour (although you can substitute cheaper margarine if you really insist) and the white cooking fat keeps it short and crisp. They will blend into the pastry better if they’re at room temperature so take them out of the fridge 30 minutes before you want to use them. If you’re not using a food processor, work on a cool surface and work quickly and lightly. If you overwork the pastry it’ll be hard. For larger amounts, increase the ingredients in proportion. If working by hand, sift the flour and salt into a bowl. Cut the butter and cooking fat into small pieces and add it to the flour. Rub it in using your fingertips, lifting it up and letting it fall back into the bowl. Continue until the mixture looks like fine breadcrumbs, with no loose flour left in the bowl. Sprinkle over the water and cut it through the dough with a table knife, until it all clings together and the mixture leaves the sides of the bowl. If you’re using a food processor, put the sifted flour and salt into the bowl, add the cubed fats, clamp on the lid and process briefly until the mixture resembles fine breadcrumbs. Turn off the machine, add the water through the hole in the top and pulse until it comes together into a ball, leaving the sides of the bowl clean. In either case, turn the pastry onto a lightly floured board and knead briefly to remove any cracks. Allow the dough to rest for 15-20 minutes before rolling out, or form into a flattened ball, wrap tightly in clingfilm and refrigerate. Take it out 20 minutes before you want to use it and bake at 200C/400F/Gas Mark 6 unless otherwise indicated in your recipe. Enriched shortcrust (enough to top a large pie): 225g plain flour, 1/2 tspn salt, 110g butter, 40g white cooking fat, 1 egg plus 1 egg yolk. Sift flour into a bowl, add salt, and rub in the two fats as above until you have a breadcrumb consistency. Beat the egg and extra yolk with 2 tbsp cold water and blend into the pastry, kneading it in the bowl until it leaves the sides clean. Form into a disc, wrap and chill in the fridge for at least 1 hour before using. Sweet shortcrust (makes just over 350g): 225 g plain flour, pinch of salt, 100g butter, 15g white cooking fat, 25g caster sugar, 3 tbsp cold milk. Proceed as in the basic shortcrust recipe except mix the sugar into the milk and add it in lieu of the water. This entry was posted in Basics and tagged Basics, shortcrust pastry by Linda Duffin. Bookmark the permalink. It’s a rare chef I’ve seen who makes his own puff, although who knows what they do in the privacy of their own kitchens? I’ve just bought some spelt flour to experiment with (I’m a bit behind the times here) so it’s interesting to hear your views on it, thanks. I like the idea of ‘Basics’. Keep at it. Aye aye, Cap’n. Any suggestions?